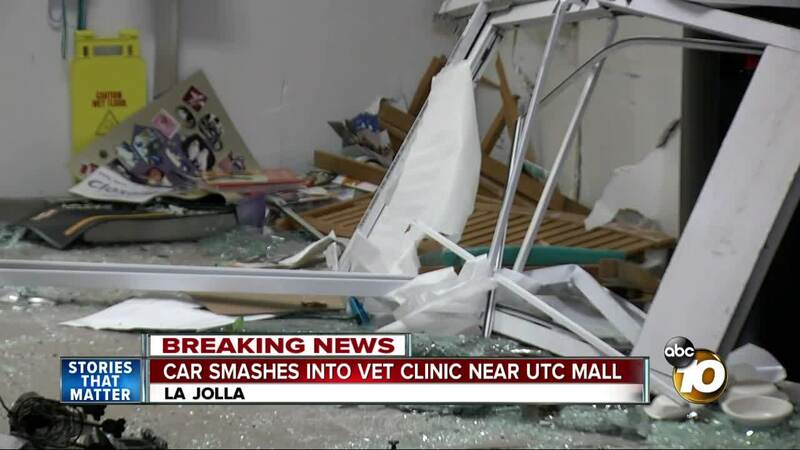 UNIVERSITY CITY, Calif. (KGTV) - A car crashed into a veterinary clinic near La Jolla Friday night. No people or animals were injured when a car plowed into the building on Town Center Dr. at 9:30 p.m.
San Diego Fire Department says the driver told them he accidentally drove into the the front of the Cote Animal Hospital. There was a staffer inside the vet hospital with animals when it happened. The 75-year-old male driver got out of the car himself and was taken to a local hospital as a precaution.